Cycling, asides from being a great source of exercise is also a fun social activity. There is nothing better than a cheeky coffee after a long ride. It is also a fabulous form of stress relief. Due to it’s low impact nature, cycling can be enjoyed by all ages. Here are my top 5 benefits of cycling. Cycling is an aerobic exercise which helps to burn calories. It gets more blood pumping throughout your whole body by raising your heart rate. The side effects of doing this sort of exercise – it helps to keep your weight down* and reduces the risk of cardiovascular diseases. * Of course this does all depend upon your calorie intake at the cafe after your ride!! Too many cakes and donuts with your post ride coffee might increase your weight!! 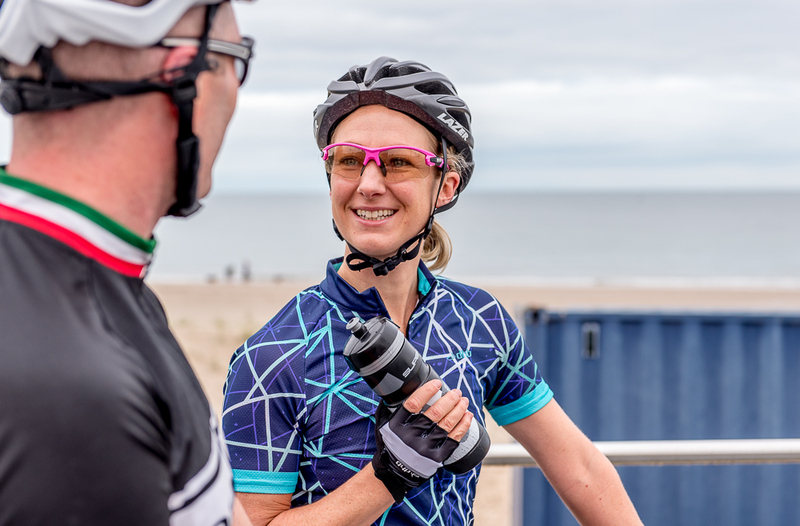 Just like other forms of exercise, cycling triggers the release of endorphins, your feel-good hormone, making you feel happier and more positive. Regular cycling also improves the body’s ability to regulate the hormones cortisol and adrenaline. This results in an improvement in your ability to handle stress. Try riding through the woods, the countryside, or near the beach, it can make you feel so much better. Cycling doesn’t just keep your weight under control, it also helps build muscle, particularly your quads, hamstrings, glutes and calf muscles. The higher percentage of muscle in your body, the more you burn fat whilst at rest! Winner! If you want to increase your strength and muscle tone then try Bike Blitz. Bike Blitz is a 4 week online training program that uses gym and home based exercises to increase strength in your core and legs. It is specifically designed for cyclists. Visit www.bikeblitz.com.au for more info. If you are suffering from joint-related pains and diseases, cycling is a good start as it’s low impact. It doesn’t stress your joints as much as impactive sports like running. Cycling also improves your balance and coordination, hence helping you prevent falls and fractures in the future. Getting exhausted because of cycling and other forms of exercise can help you sleep better. Scientists have suggested that this may be because of the reduction of anxiety due to endorphins being released during exercise. These are just a few of the many ways that cycling can benefit you. Also when you choose to incorporate riding into your daily routine, you are not the only person benefiting from it. Your actions are benefiting the environment and helping all those around you to breathe in fresher air. Incorporating cycling into your family’s daily routine reduces the amount of time spent in-front of the TV and helps build healthier habits in the future. Go on, hop on your bike and pedal it all out. For more support and training ideas to help you improve your cycling strength, fitness and speed visit www.bikeblitz.com.au and either sign up for the FREE core program or give the 4 week program a go!